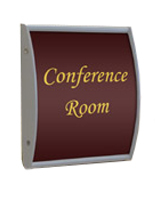 This Affordable Sign Supply Purchased in Bulk Means Easy Sign Making For Your Company! Hundreds of These Sign Supplies Are Ready to be Shipped Out! Media Size: 5.5" x 6"
2.5" x 8.5" 3" x 4" 3" x 5" 3" x 8" 3" x 11.5" 3" x 15" 4" x 5.5" 4.5" x 24"
5.5" x 9" 5.5" x 15" 6" x 7.5" 6" x 8.5" 7.5" x 10" 7.5" x 11.75" 8.5" x 11" 8.5" x 16.5" 11.5" x 17"
Backer is made from black, anodized aluminum for durability. 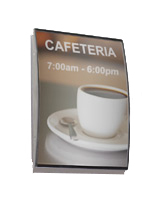 Non-glare lens prevents glare from hindering the view of your displayed posters. Suction cup included for customers to easily lift provided lens for quick signage changes. 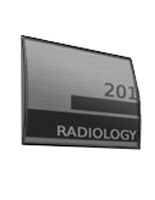 Features double-sided foam tape to affix frame to most flat surfaces. This commercial sign supply for mounting posters does not include graphics. Nevertheless, signs can be usually effortlessly generated and printed on any ordinary printer. Your artwork can be easily switched out as well by utilizing the supplied suction cup. This signholder, sign supply comes with a suction cup to take away the anti-reflective overlay, and slide your new sign into the frame. 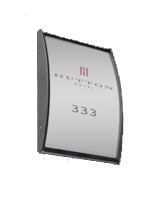 These name plates are used to exhibit warning signage, occupant's titles or division directories. Fitted with double-sided foam tape, this sign supply is quickly affixed to most flat surfaces, in either upright or horizontal orientation. An inside sign exhibit, like the one observed at this site, can assist to provide your workplace location a expert look. 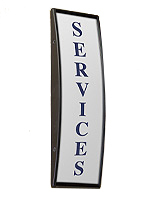 Order this quality sign supply for businesses now! 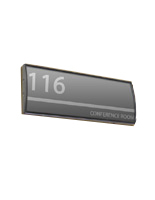 This convenient sign supply that displays wall signs is suitable for exhibiting room numbers in colleges and schools, employee names on workplace doors, or wayfindings in various businesses. 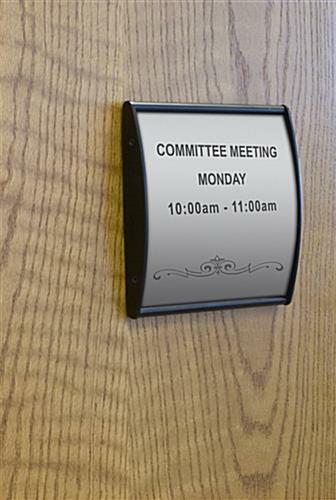 This shop signage has a long-lasting, metal backer with a black finish to effortlessly match with any environment. The metal composition assures this sign supply will survive longer than those made from plastic. 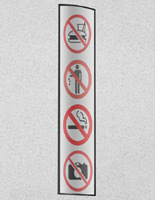 Every sign comes with a non-glare lens to stop reflecting light from hindering the view of the posters. The lens also protects the exhibited artwork from getting ruined as well. 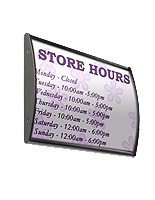 This sign supply, also known as an inside sign display, has a curved design to grab visitors' eyes from every angle. 32.0" x 6.3" x 0.875"